HEALING for any animal that may need it. contact@sterlingwolff.com or use the contact form in the menu. There is a real spiritual awakening and great desire for knowledge on the healing arts and how to better connect with the powerful universal energies. If you are looking for answers on how to improve your life then you have come to the right place. 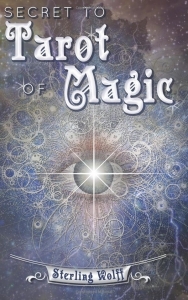 Sterling Wolff is a renowned psychic healer, born with natural healing powers. She specialises in the use of crystal healing and has an inherent affinity to the ‘Magic Touch’ for which she is very well known. Being a practicing White Witch she can use her magical knowledge to help and empower those in need. She offers professional empowerment and energy coaching. 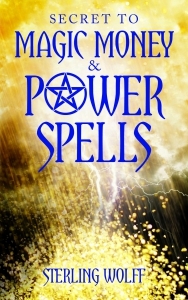 Wolff also has special skills in Magic, Spells, Healing, and Empowerment and in the Reading of Energies, Auras and Tarot Cards. Her international clientele is a testimony of her abilities and psychic prowess. Her clients from across the world range from celebrities, actors, artists, musicians, rescue organisations and also individuals. She has an empathic inspirational and powerful approach that makes her easy to connect with. self and draw from the hidden powers that each one of us have within and align it with the universal energies. Every individual possesses varying degrees of energy vibrations and depending on how these are channelled they can become powerful tools of healing and enlightenment. Through each of her books Wolff will guide you on how you can make the best use of positive energy vibrations with special secret formulas to turn around any situation in your life into a favourable one. You gain great knowledge and understanding in order to alter and improve your daily life. 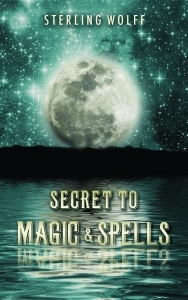 All these magical secrets to a better more fulfilled life can now be yours by a simple click on the book links given. 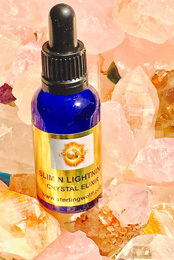 These powerful Crystal Elixirs are for Slimming, Love, Fertility,Wealth and Empowerment, Detoxifying and also available are pure Crystal Essences. THESE ELIXIRS ARE PROGRAMMED FOR WEIGHT CONTROL AND TO ASSIST IN ACHIEVING YOUR IDEAL BODY WEIGHT. 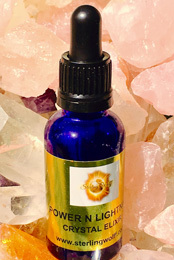 Ingredients include Amyethyst, Apatite, Citrine, Iolite, Rose, Quartz, Serephinite, Organic Apple Cider Vinegar with the “Mother” unpasteurised and naturally gluten free, water. Amethyst – It assists with breaking bad habits, over eating and especially beneficial for those who may have addictive and eating disorders. It assists with bloating, cravings and helps you control your appetite by promoting calm energies that is grounding. Powerful and extremely effective for suppressing the appetite and speeding up metabolism. It also assists with maintaining the correct and ideal body weight. This contains the antioxidant beta-carotene, which helps break down and remove unwanted fats and toxins from your body. Main benefits are major weight loss, belly fat reduction, purifying blood, detoxifying the liver, improving circulation and digestion. Clear Quartz, Smokey Quartz, Tigers Eye, Tourmaline,Organic Apple Cider Vinegar with the “Mother” unpasteurised and naturally gluten free, Water. All ingredients have been supercharged by lightning and the Celestial Elements. 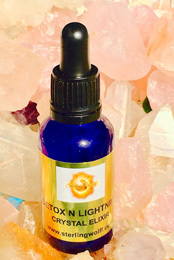 Detoxifies the body especially the liver and eliminates negative energy and clears the auric field. Stone of protection – brings harmony and balance. For protection against negative energies especially electromagnetic pollution such as phones computers television. Cleanser and purifier. Organic Apple Cider Vinegar with the “Mother” unpasteurised and naturally gluten free. 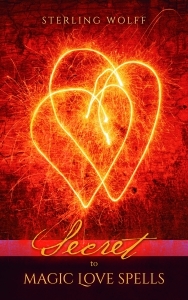 ATTRACTING LOVE, SELF LOVE, THE HEART OF THE ONE YOU DESIRE, IMPROVING RELATIONSHIPS, FINDING NEW LOVE. Rose Quartz, Amethyst, Ruby, Red garnet, Fire Quartz, Pink Tourmaline Carnelian, Organic Apple Cider Vinegar with the “Mother” unpasteurised and naturally gluten free, Water. All ingredients have been supercharged by lightning and the Celestial Elements. Rose Quartz – Stone of love and healing. Assists in transformation attracting love and it’s a grounding stone. 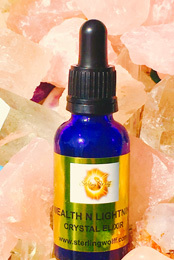 It stimulates vitality and sensuality – boosts energy levels and increases self esteem. It’s a stone of passion, protection and physical love. This attracts adventure and provides increased energy and vitality. Heals the heart and brings peace. Encourages self love and confidence. Good fortune amulet . Great energiser and motivator It’s a stone of creativity and love. SPICING UP YOUR LOVE LIFE, INCREASING FERTILITY ESPECIALLY HELPFUL IF YOU WANT TO GET PREGNANT. Rose Quartz, Moonstone, Carnelian, Unakite, Jade, Rhodonite, Ziosite, Organic Apple Cider Vinegar with the “Mother” unpasteurised and naturally gluten free, Water. All ingredients have been supercharged by lightning and the Celestial Elements. Stone of love, self – love and powerful for attracting love. Traditionally used for feminine healing, fertility & love. It assists in balancing of the female hormones & cycles. This will help you to get motivated in the right direction. Clarity of thought. Stone of fertility – this is great for balancing the reproductive system helping you to conceive. Helps in fertility and child birth. It protects from harm. It stimulates fertility and fills the body with a sense of love. It further promotes pregnancy. 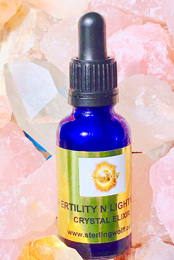 This is for boosting fertility and increasing levels of energy. It attracts positive happy energies dispelling doubt. POWERING UP, EMPOWERMENT, IMPROVING CONFIDENCE, BOOSTING SELF ESTEEM. Citrine, Lapis Lazuli, Golden Aura Quartz, Epidote, Heliodor,Peridot, Black Tourmaline, Organic Apple Cider Vinegar with the “Mother” unpasteurised and naturally gluten free, Water. All ingredients have been supercharged by lightning and the Celestial Elements. This is known as the merchants stone. It brings success, happiness and prosperity. This will attract wealth of success and power. It is a stone of nobility and protection. Stone of manifestation of power. It is for empowerment and increases intuition. This has powerful metaphysical properties. Attracts abundance and prosperity. This is stone of the sun, it increases personal power and focus. It encourages stronger willpower. A stone of power and healing. It is visionary it highlights purpose and bestows peace of mind. Protection of power and energy. It clears obstacles increases power, physical strength and vitality. Citrine, Green Aventurine, Sunstone, Goldstone, Black Stone, Moss Agate Golden Ritulated Quartz,Organic Apple Cider Vinegar with the “Mother” unpasteurised and naturally gluten free, Water. All ingredients have been supercharged by lightning and the Celestial Elements. Powerful crystal for long lasting wealth and prosperity. Attracts good fortune and brings good luck. Stone of prosperity, wealth and opportunity. It promotes leadership and power. Attracts good fortune. Stone of success and wealth . It bestows clarity and leadership ensuring successful outcome for your endeavours. Great healer attracting confidence and ambition. Attracts wealth and prosperity. Promotes wealth and abundance into your life. Stone of success and achievement. This is a great amplifier and can bring great wealth quickly. Stone of prosperity and power. 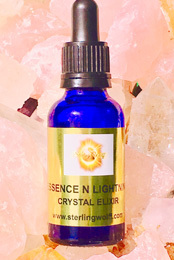 MOTHER ELIXIRS GREAT BOOSTERS AS IT IS THE PURE POTENT ESSENCE OF EACH CRYSTAL LISTED. YOU CAN DRINK IT IN WATER OR ADD IT TO YOUR BATH. Rose quartz, Amethyst, Aquamarine, Lepidolite, Blue calcite, Black Tourmaline, Quartz, Amazonite, Smoky Quartz, Water. 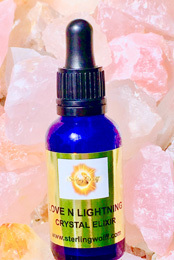 All ingredients have been supercharged by lightning and the Celestial Elements.